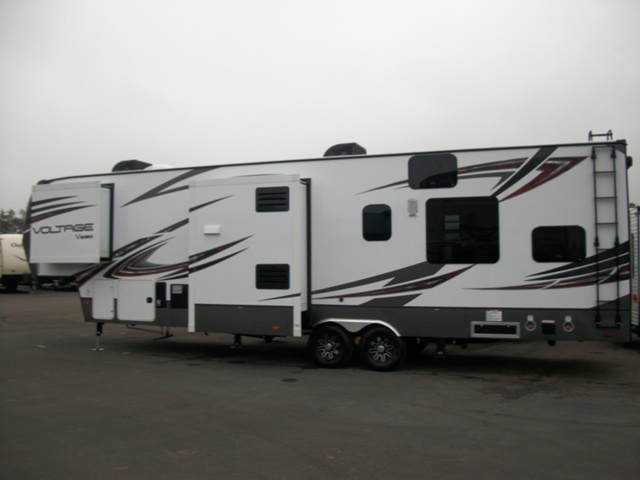 This towable sleeps 7 people, is 3.58 feet long, and is a Fifth Wheel. I have a beautiful 2016 Voltage by Dutchman toy hauler ready to take you on your dream vacation. Don't waste your time renting one of the little bumper pull RV's. 2 Massage/heated leather recliners 4 other regular recliners 4 TV's with yamaha sound bar outdoor speakers 2 awnings back porch holds up to 2500 lbs of ATV's or toys in the garage LED accent lighting 3 queen beds eating area full kitchen largest refrigerator/freezer on the market (propane/electric) 2 50lb propane tanks 2 x bathrooms 3x AC units central vacumn central heating arctic package and much, much more!!! I prefer to deliver the RV to your vacation site. My delivery fee is based on the location and will be worked out during the booking process. This usually works out best for both of us because most people don't have a truck set up to pull this size of a unit. If you desire to pull the trailer yourself, it requires a 21K fifth wheel hitch properly mounted to a 1 ton truck or better. Experience pulling a fifth wheel is desired.